The country's top planner Wednesday warned that this year's extreme weather conditions, plant diseases and insect infestations could seriously affect the autumn harvest. About 11.5 million hectares of arable land have been hit by drought this year, 2.14 million more than the average for the past few years, Ma Kai, minister of the National Development and Reform Commission, said. Figures from the Ministry of Water Resources also show that floods have submerged about 9.7 million hectares, pushing the total amount of disaster-hit land to more than one-sixth of the country's 120 million hectares of arable land. The situation could be even worse in the autumn if the widespread flooding and droughts persist, Minister of Water Resources Chen Lei told a press conference on Tuesday. Ma said the country's crops had also been hit by "serious" plant diseases and insect pests, but he did not give any details. However, the national agricultural technology popularization and service center under the Ministry of Agriculture has predicted that insects will affect a cumulative area of 69 million hectares of the country's rice fields this autumn. The media also reported earlier this month that in Sichuan Province, one of the country's grain bases, rice plant-hoppers had devoured at least 390,000 hectares of the crop by the end of last month. "It's the most serious outbreak in Sichuan for 16 years," the China News Service reported. "We're facing a grave situation," Ma said while making a report to the Standing Committee of the National People's Congress. "We must fully implement all favorable agricultural policies and try our best to fight back against disasters and disease to maximize the autumn grain harvest this year." The favorable policies, Ma said, include direct subsidies for grain farmers, agricultural insurance for major plants, more input to the rural infrastructure construction and the promotion of advanced farming technology. The autumn harvest usually accounts for 70 percent of the annual grain production. Therefore, despite a slight increase in the summer harvest, overall production for the year could be down if the autumn harvest is badly affected. 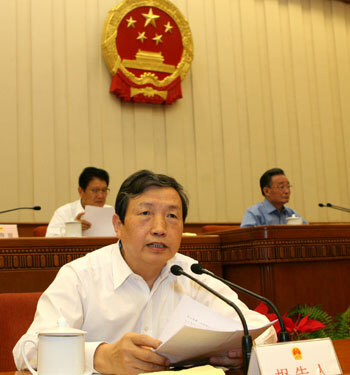 Song Tingmin, vice-president of the China National Association of Grain, warned that a decline in the autumn harvest could cause further inflation. "Given the tightened food supply in the international market, a decline in domestic grain production could lead to more price hikes," he said. The country's CPI grew 5.6 percent last month. The government has treated rising food prices - fuelled by the rising grain price - as the major contributor. But Qi Jingmei, a senior economist with the State Information Center, said she was optimistic about CPI inflation because of the increase of the sowing area and the abundant food reserves, according to the Shanghai Securities News. Ma yesterday also said the blue-ear disease in some areas had affected the livestock farming. The rising price of feed and young animals might also exert pressure on the price of agricultural products. He urged governments at all levels to fully carry out the policy of free compulsory vaccination of pigs and sow insurance in the rest of the year. The minister also called for closer monitoring of the supply and demand, and prices of grain, meat, eggs and cooking oil. He reiterated that governors and mayors should be directly responsible for local retail food prices.